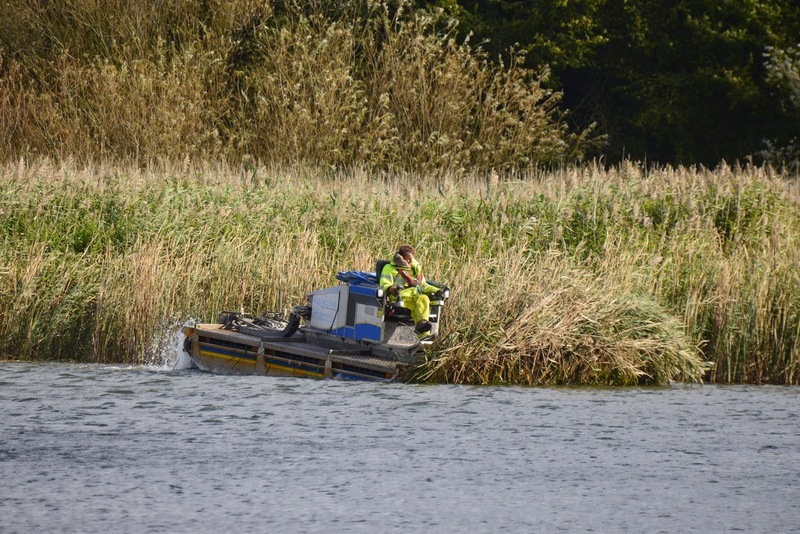 Today we was informed by the Canal and River Trust that a determined group of people have decided that it is their right to swim where and when they want in the reservoirs. They have apparently engaged a solicitor to present their case. If you have no sympathy with their case, could you please present your grounds against free swimming in the reservoirs to Ian Final at Ian.final@canalrivertrust.org.uk. He can then use them to back up the his objections as he might need all the support he can get. BMERC will be holding some ‘trial’ data surgeries in Buckinghamshire and Milton Keynes on Wednesday 5th and Thursday 13th November 2014. We are aware that data isn’t always reaching BMERC, for various reasons, and we want to try and address this. I have attached a pdf document explaining more about the reasons and aims of the surgeries - ‘BMERC DataSurgeries’. and Dates & Venues. 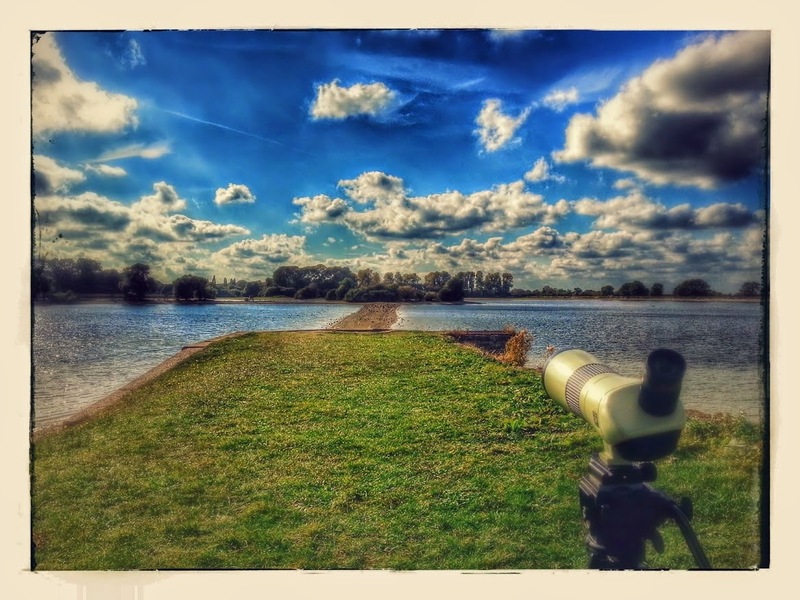 Gary Hinton - When I was at Wilstone yesterday afternoon, between the steps to the farm shop and the jetty, I spooked a bird which flew up from the edge of the reservoirs flora landing on the other side of the pier. I only had eyes on it for a short while and hung around for a while waiting to see if it reappeared, hoping other walkers would spook it again, but no luck. I think it was a pipit of some type. It could have been the ‘Rock’ recently seen or the Water which was around this area over the last few years. I thought this may be worth sharing as others may be able to help spot this bird. I did see a similar bird a few weeks ago also around the same area which when spooked by dog walkers few into the area or the woods by the farm shop steps. From the hide: A large roost of Lapwings and Golden Plovers , several small flocks of grazing Wigeon, a flock of 15 grazing Moorhens, two Little Egrets and one female Chinese Water Deer. 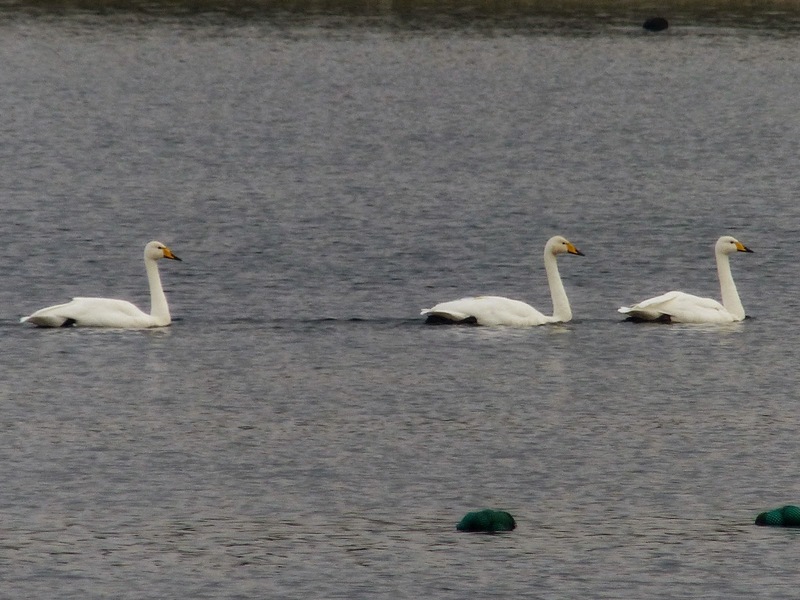 As we ate a late lunch at the car park (circa 1.45-2 p.m.) three Whooper Swans flew in from the west and landed on the water. Obviously I have only listed the high-lights, but the real enjoyment was in the sheer numbers of birds at the site. We don’t come often, but it was well worth the effort. Roy Hargreaves - This morning started off heavily overcast and murky and by the time I left the hide the Sun was poking through and the day brightened up considerably. Early this morning from the jetty two Black-tailed Godwits were along the shore in front of the reeds and I could only see one juvenile Scaup and the two feral Whooper Swans were by the spit. From the hide a Little Egret, Shelduck and a Golden Plover flock flew over. Also from the hide three of the Chinese Water Deer was fairly close to the hide but it was dull light unfortunately. This afternoon Steve Rodwell rang me to say that three Whooper Swans had flown in from the North so I headed down and they certainly seemed quite wary and moved away from the spit when someone walked along the footpath past the jetty so they seemed wild. There was also a Ringed Plover on the spit at this time. 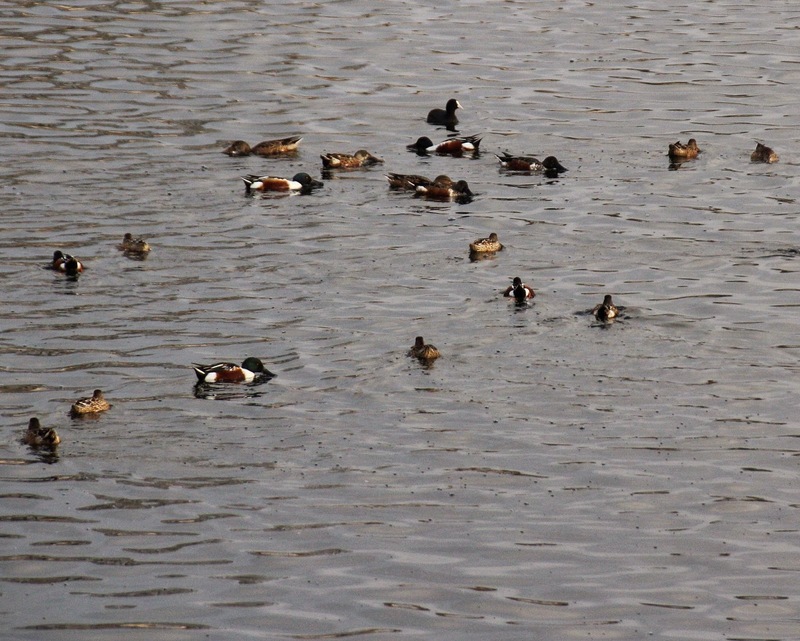 Steve also could only find one Scaup while he was there. Roy Hargreaves - Yesterday was lovely and the bright sunshine made for very different challenges photographically. The Pheasant was made easy in the bright light but the Corn Bunting was heavily backlit and was up on the Dry Canal. I also heard a Crossbill but didn’t see it, which was disappointing as it seemed to be perched. 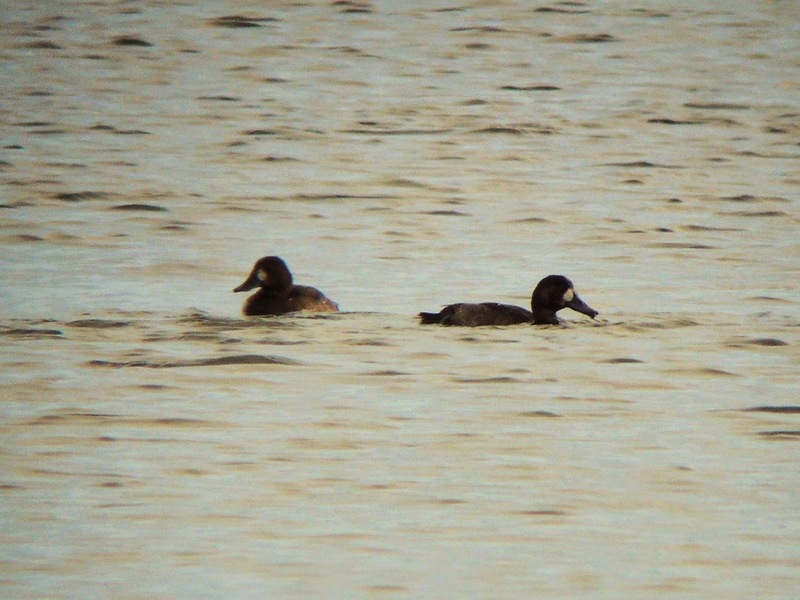 This morning the thick cloud and light drizzle meant that the sun wasn’t an issue at all, which was a pity as the two juv Greater Scaup were back together again and ended up by the spit and comparatively closer than they have been, but the light was rubbish so the ISO had to be upped resulting in grainy pictures. Also the two Black-tailed Godwits were about along with the Shelduck, 118 Golden Plover and two Whoopers but again no Pintail. Tringford had nine Red-crested Pochards and Startops had one female Red-crested Pochard and a Little Egret. 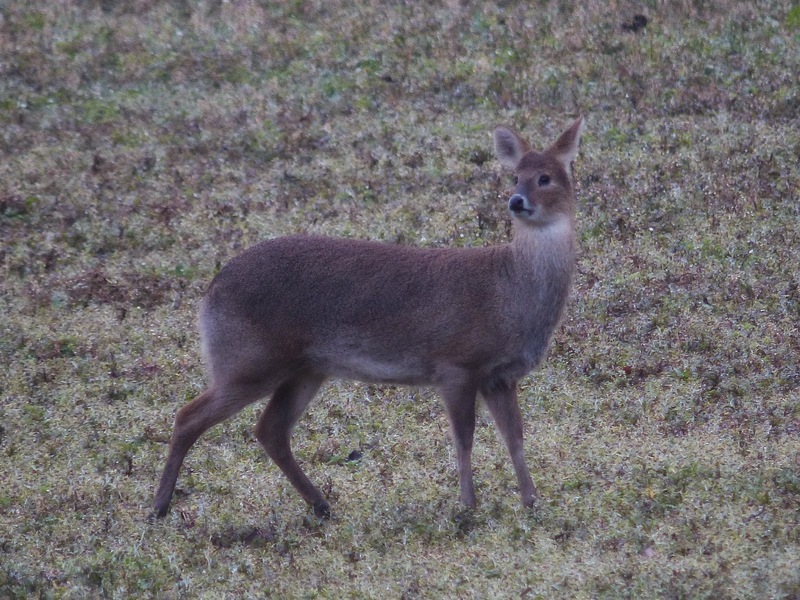 Four Chinese Water Deer were also out on the mud to the right of the hide. Peter Brazier - 10-15 Goldcrest were very mobile and vocal along the path through the woods to the hide enjoying the weather. View from the Drayton Hide today. Doug Helsby - Lovely morning walk that revealed little of note other than the Godwit and Scaup previously noted. 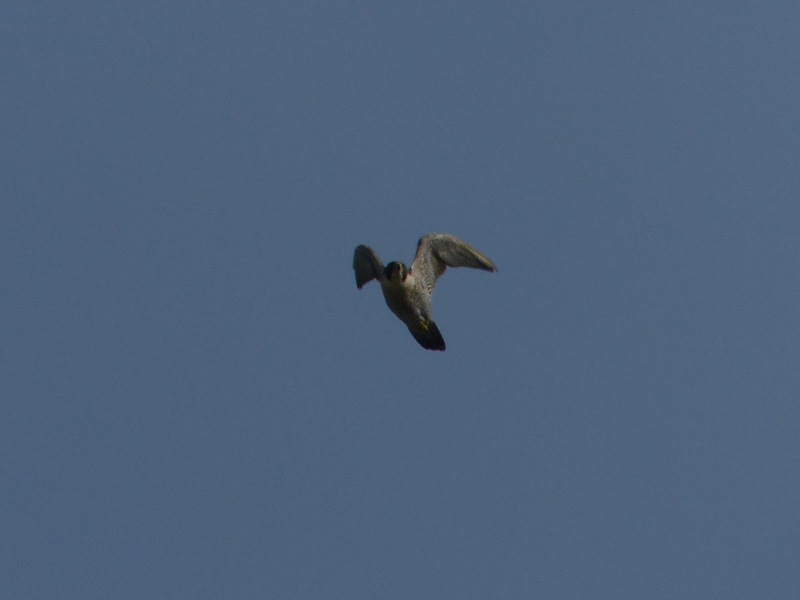 Sparrowhawk flew through. Golden Plover in good numbers and frequently flying around the reservoir. Surprised to see Clouded Yellow on path leading to Dry Canal from Rushie Meadow. James Heron - A couple of shots from Wilstone today. Roy Hargreaves - This morning two Black-tailed Godwits and a juvenile Greater Scaup were visible from Cemetery Corner and a flock of Chaffinches was also in the trees in the corner, while not huge they could attract Brambling in. The Whoopers were vocal and by the spit. From the hide there was a good number of Golden Plover with the Lapwings but I couldn't find any Pintail about. Also the cattle have been removed from the hide meadow – presumably for the winter as there seems to be little left for them to graze. David McCarthy- I found a pair of binoculars in the hide/shelter alongside Tringford on Saturday afternoon and have handed them into my local police station at Stevenage today. Please contact your local police station within Herts (phone 101) to recover otherwise they become mine after a month! Doug Helsby - First walk around Wilstone for a while and nothing out of the ordinary. 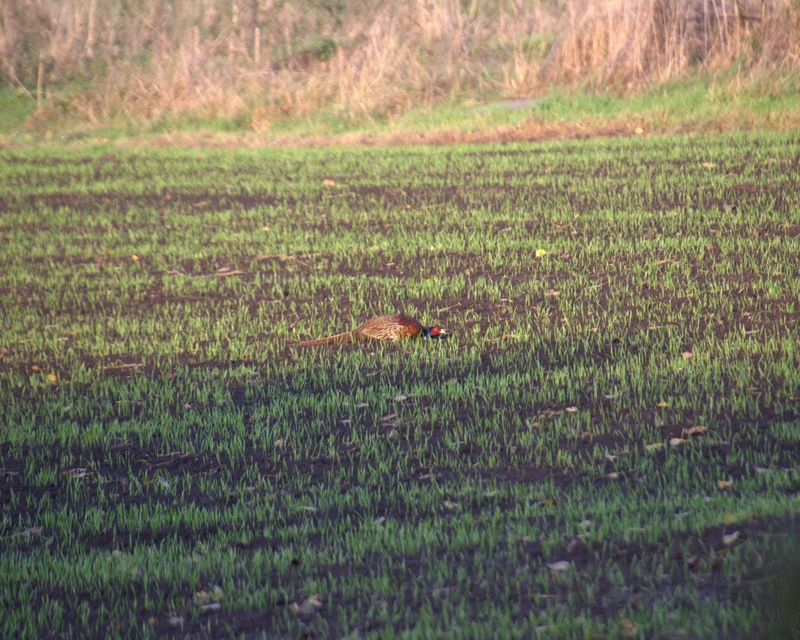 Shellduck, Golden Plover and many Lapwing. A couple of noisy Whoopers but I guess these are the 'local' birds. Does anyone know the name of the marsh plants blooming in Rushie Meadow at the moment? • Saturday 25th October 2014. Roy Hargreaves - Starting at Tringford Red-crested Pochard numbers had increased to eight and a co-operative Gadwall came fairly close to the hide. 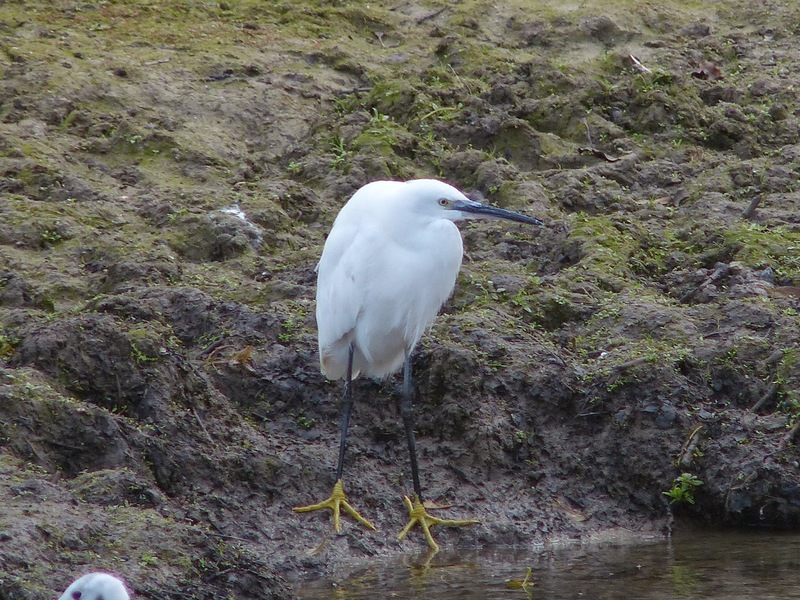 Startops had a Little Egret on the feeder stream, yesterday I saw a colour-ringed Little Egret with yellow D on the right leg and red 9 on the left leg. Marsworth I heard a singing Cetti’s and squealing Water Rails and two Brambling appeared to fly into the small wood but I couldn’t find them. On Wilstone the Black-tailed Godwit was in Cemetery Corner but I couldn’t find the juvenile Greater Scaup or male Pintail which were both about yesterday. About 80 Golden Plover were mobile as usual and on one occasion a male Peregrine flew towards and over us having put all of the plover up. Today the larger raptors were taking advantage of the sunny weather and several Buzzards and Red Kites were up and mobile too. • Thursday 23rd October 2014. Roy Hargreaves - This morning the Black-tailed Godwit was in Cemetery Corner, as were two Chinese Water Deer. 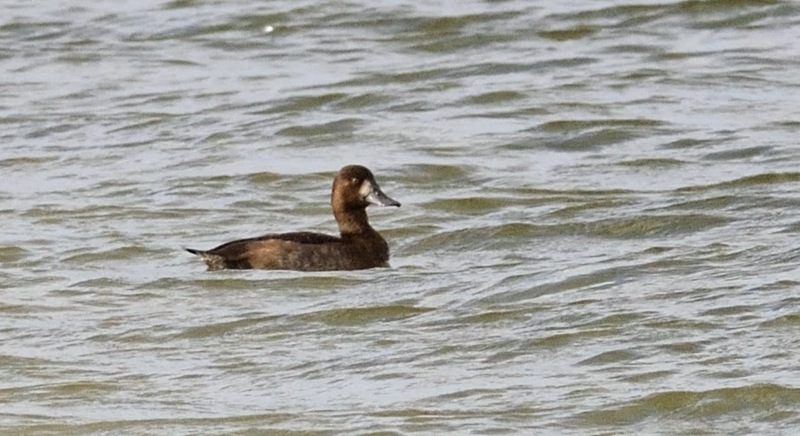 From the jetty a juvenile Greater Scaup was off to the left of the spit and is presumably one of Sunday’s birds. The two Whoopers were in the spit area too. Walking round to the hide I saw three Pintail flying from by the mud over to the Drayton Lagoon, where they were when I got to the hide. By the old overflow I saw a flock of about 35 Lesser Redpoll, or Redpoll as they’ll be no doubt known in the not too distant future. From the hide there was a lone Little Egret, about 20 Golden Plover and the Common Shelduck as well as the aforementioned Pintail and also three Chinese Water Deer. Walking through the fields back to Tring I also noted a single Lesser Redpoll. • Wednesday 22nd October 2014. Roy Hargreaves - Having gone blown about yesterday morning and seen nothing new at any of the reservoirs in the morning it was nice to get out this morning in the sunny conditions, even if the temperature was down a fair bit. Checking the Greylags in the field behind the jetty I saw a covey of partridge fly over the road and scoping them it turned out to be nine Grey Partridge. Otherwise, I saw Black-tailed Godwit, Shelduck, a few Pintail, 8 Snipe and the two feral Whooper Swans. 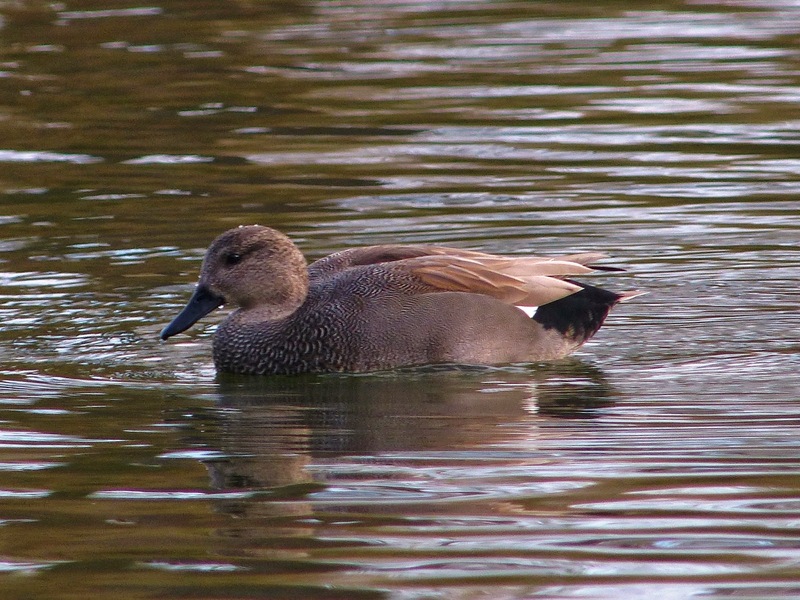 No sign of the Ruff and Pintail numbers were definitely further down on Monday’s number. • Tuesday 21st October 2014. The Truxor was busy at Marsworth today. • Sunday 19th October 2014. David Hutchinson - Nice to see a number of Golden Plover with the Lapwings this morning. A single Ruff was also amongst the group seen from the Hide. From the jetty a single BT Godwit and the two Scaup. Roy Hargreaves - This morning was breezy but dry. I met up with David Bilcock and we started at the jetty where the Ruff was on the spit in front and David started scanning from the corner and picked out an adult Mediterranean Gull, which was there for a few minutes before flying towards the hide and we didn’t see it again. While walking round to the hide we heard and saw two Brambling flying over. From the hide one Little Egret was visible and the Ruff had relocated to the mud and was near the Golden Plover flock. Again we both scanned in different directions and David spotted two juvenile Greater Scaup off to the left of the hide in the same area the Ring-necked Duck frequented last year. I managed one photo with the both visible and not back-end on. Walking back from the hide two Black-tailed Godwits were roosting among the Black-headed Gulls on the edge of the mud and it seems clear that Pintail numbers have reduced. • Saturday 18th October 2014. Roy Hargreaves - At Wilstone most of the Pintail had moved to the quarter of the reservoir by the Cemetery Corner and there seemed to be a slight reduction in numbers. From the hide the Common Shelduck was still present and also two Black-tailed Godwit, the Ruff and about 40 Golden Plover. Predictably no sign of any Grey Plover either. Tringford had five Red-crested Pochards and a Cetti’s was singing in the Marsworth Reeds. • Friday 17th October 2014. 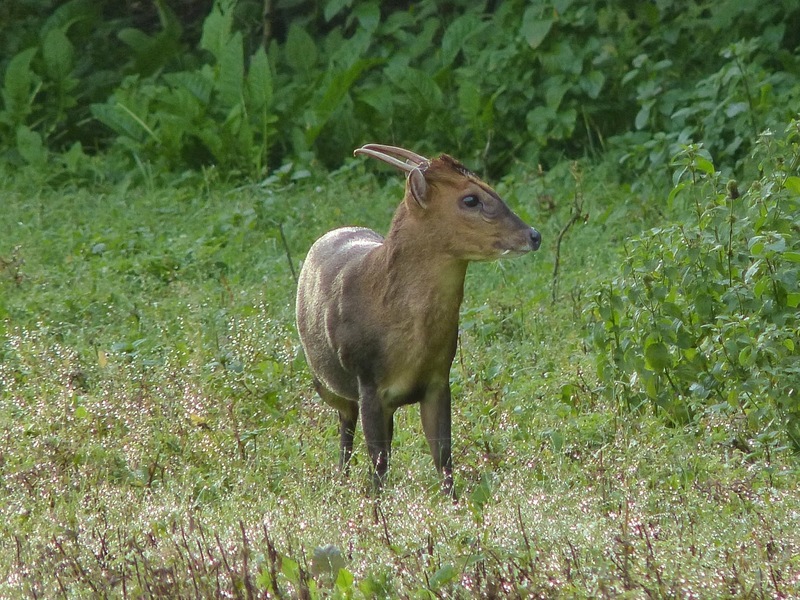 Roy Hargreaves - Yesterday was pretty much the same birds as the day before and the highlight was a close-up Reeves’ Muntjac. Today was not bad weather wise and from the jetty there wasn’t much but I did manage good views of a few Meadow Pipits on the concrete banks but no photographs. As I walked by the overflow I heard a Grey Plover calling and scanning the sky I could see a flock of Golden Plover and two other Plovers, which turned out to be Grey Plovers. After both groups of Plovers flew round for a while they landed out of sight on the mud to the right of the hide. I hurried round there to confirm that they were still there and sure enough they were. The Golden and Grey Plovers flew up and round on several occasions and the Sun was out and so the light was terrible and the birds were distant so digiscoping was the only option and this rubbish photo is the best that I have of one of the Grey Plover. I have also attached a photo of them both, which is even worse. From the hide other birds were the Shelduck, Ruff, three Black-tailed Godwit, 10+ Pintail and Little Egrets had increased to three birds today. 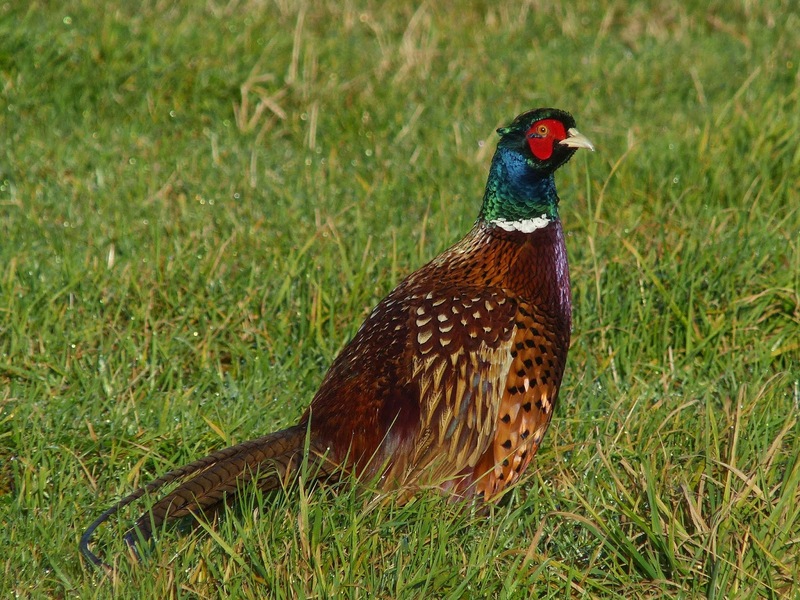 In the fields I saw a family of four Red-legged Partridge and Redwing were in the hedges and not flying over as they had been earlier in the week. I think the only grey bird I have left to see now, that I have seen before at the reservoir, is Grey Partridge. Of course Great Grey Shrike would be very nice – as if! • Wednesday 15th October 2014. Roy Hargreaves - Although drier than yesterday visibility was murkier. I heard a Brambling fly over the Dry Canal and during the course of my walk I saw 500+ Redwing and one lone Fieldfare flying over. Also Skylarks were on the move and I heard Goldcrests in a number of locations indicating an influx. On the reservoir itself four Black-tailed Godwits, Ruff, eight Common Snipe, one Shelduck, two Little Egrets, 28 Golden Plover and an uncounted number of Pintail. James Heron - A couple of pictures from WIlstone yesterday. • Tuesday 14th October 2014. Roy Hargreaves - This morning low thick cloud covered the sky completely and having not got out yesterday due to the torrential rain I was keen to get out this morning. 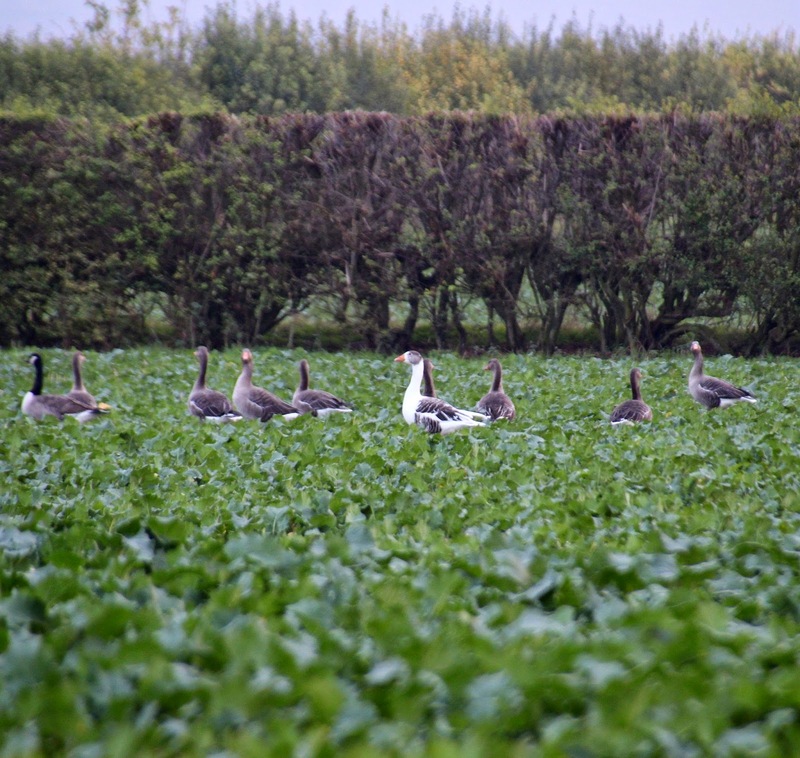 Starting at Wilstone I was walking to the jetty, and by the steps down to the farm shop, when I heard a rare goose. I spotted it as it took off and was pleased to see a Pink-footed Goose. It flew round and flew off towards Broughton so I was off to a great start. Heading for the jetty for some reason the Lapwing got up and while checking through them I saw a Dunlin and I carried on searching and saw something else. As it banked round and headed towards the Boathouse I realised it was a Grey Phalarope. It settled on the water in that corner and I set my tripod and scope up and scanned but couldn’t find it. I scanned everywhere and texted a couple of people I thought might be out. Mike Wallen and Rob Andrews were on the hills so I hurried to the hide but couldn’t find the Phalarope! In the course of looking I counted 16 Pintail and saw two Rock Pipits with Meadow Pipits and Pied Wagtails distantly on the mud to the right of the hide. I also saw four Black-tailed Godwits, one Ruff and one Shelduck and 12 or so Barn Swallows came in. I tried the smaller reservoirs also to no avail and had seven Red-crested Pochards on Tringford. I also picked up on my pager a report of a Grey Phalarope at Queen Mother Reservoir near Slough, which could be the same bird I suppose or another entirely as I gather there is a quite a passage this morning. I’m just sorry that neither bird lingered for others to see. P.S. there was a juv Black-necked Grebe on Wilstone and a Brambling behind the new overflow last night – report from David Bilcock. They could still be about as I was very focussed on relocating the Grey Phalarope and didn’t check the small grebes at all in my efforts. • Sunday 12th October 2014. Roy Hargreaves - Today was perfect for doing the WeBS count being fairly bright with little wind. Startops was the first port of call and had three Black-tailed Godwits on the mud at the southern end of the reservoir. On Marsworth I heard two Water Rails but saw little out of the ordinary. Tringford had seven Red-crested Pochards so numbers still seem to be increasing and there is a muddy fringe here too. 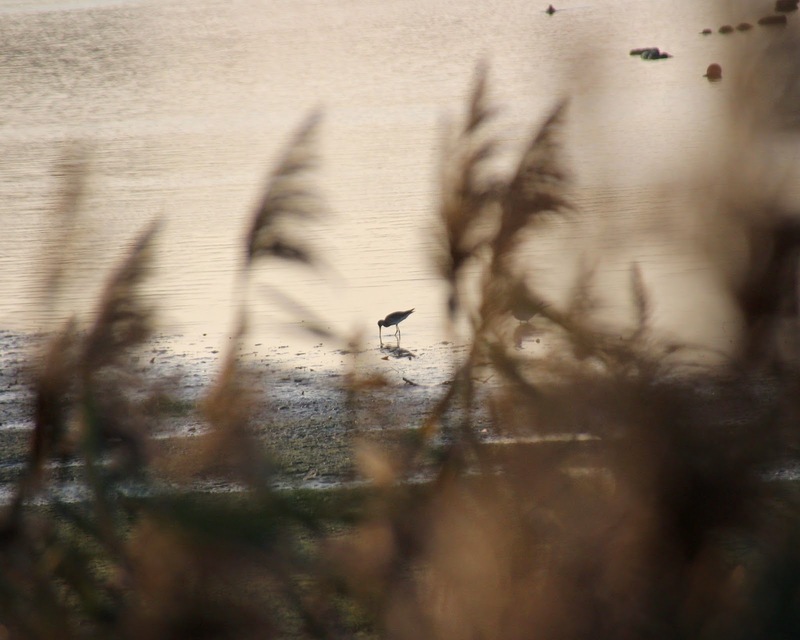 Wilstone had two Dunlin on the spit in front of the jetty and the Ruff and four Black-tailed Godwits were on the mud by the hide – three of them having relocated from Startops. A flock of nineteen Golden Plovers was about. On the wildfowl front there were fifteen Pintail including one male in plumage close to normal and another on the way to it. The Shelduck was still about. Noteworthy counts were 23 Little Grebes across the complex and 872 Coot. • Saturday 11th October 2014. Roy Hargreaves - This morning I started at the jetty and saw a Ruff walking along the left hand side of the spit and two Ringed Plover on the spit and also eleven Golden Plover mingled with the Lapwing. Three Black-tailed Godwits were on the mud between the overflow and hide and Pintail were scattered about too. David Bilcock heard and watched a Rock Pipit fly from between the old and new overflows out towards the middle and disappeared on to one of the banks. • Friday 10th October 2014. Chiffchaff on Startops as I covered the three smaller ressies, Roy as usual did Wilstone. Roy Hargreaves - Wilstone was very similar to yesterday only the sun was out and the wind was less evident. The hirundine flock were still present despite the very good weather and I saw one Barn Swallow among the House Martins. I could only see 11 Pintail today but one is a nice male that appears to have largely completed its moult. 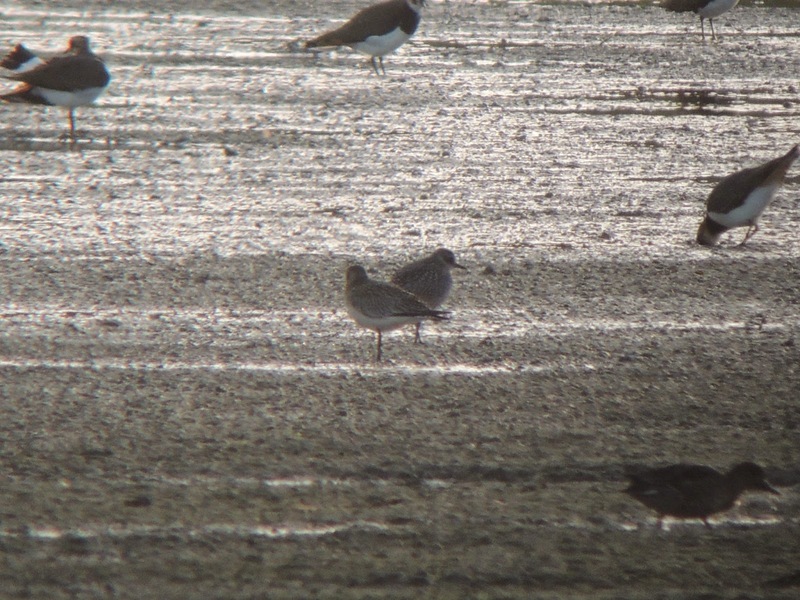 Waders included two Black-tailed Godwits, three Ringed Plovers, one Golden Plover and a Common Sandpiper. Today Skylarks were still moving but Meadow Pipits were also moving and in greater numbers than the Skylarks. I also heard a probable Rock Pipit but didn't see it and I only heard it once and so it may have been flying over. • Thursday 9th October 2014. Roy Hargreaves - This morning I managed to walk down to Wilstone and so I did a complete circuit. There was no sign of the Rock Pipits that I could see. About 40 lingering hirundines were still about and all were House Martins apart from two or three Barn Swallows. 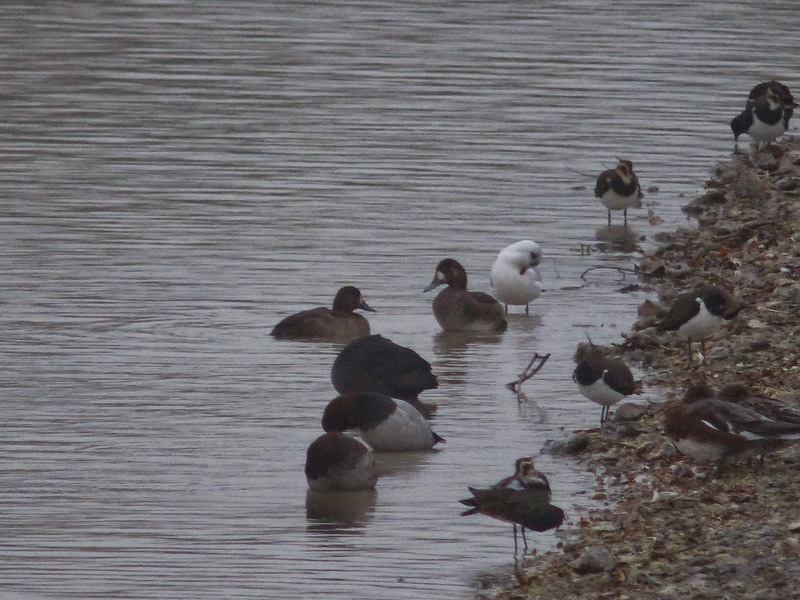 A Shelduck was still about and Pintail numbers had risen to 13. I could only see one Black-tailed Godwit today and one Common Sandpiper and three Ringed Plover. Also Skylarks were moving overhead in small parties. • Tuesday 7th October 2014. Roy Hargreaves - Having got back from an eventful week on Shetland it was good to get round the reservoirs this evening. Tringford had a pair of Red-crested Pochard and Startops had more a lot more mud than when I left and more dabbling duck as a consequence. At Wilstone as I walked to the jetty I heard and then saw a Rock Pipit fly past me and was able to scope it as it fed in a very small bush in the north corner of the reservoir. From the jetty the best thing I could see was a Black-tailed Godwit and as I walked back I saw the rock Pipit again and carrying on round to the overflow I had another Rock Pipit fly past me towards where I had left the first one. Looking back with someone else who was there we saw both Rock Pipits together on the water’s edge. On or by the large expanse of mud there were four Pintail, another Black-tailed Godwit, Common Sandpiper and three Ringed Plover seemed to fly in to roost on the mud. 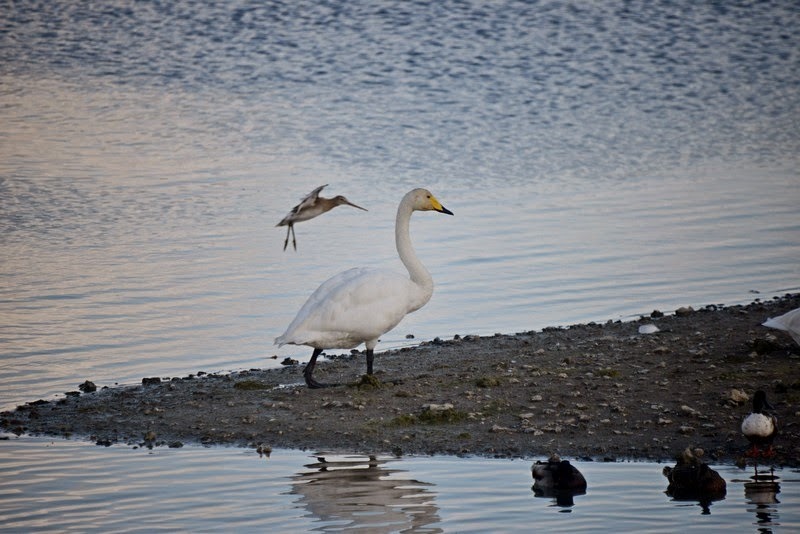 Also the two Whoopers were there. 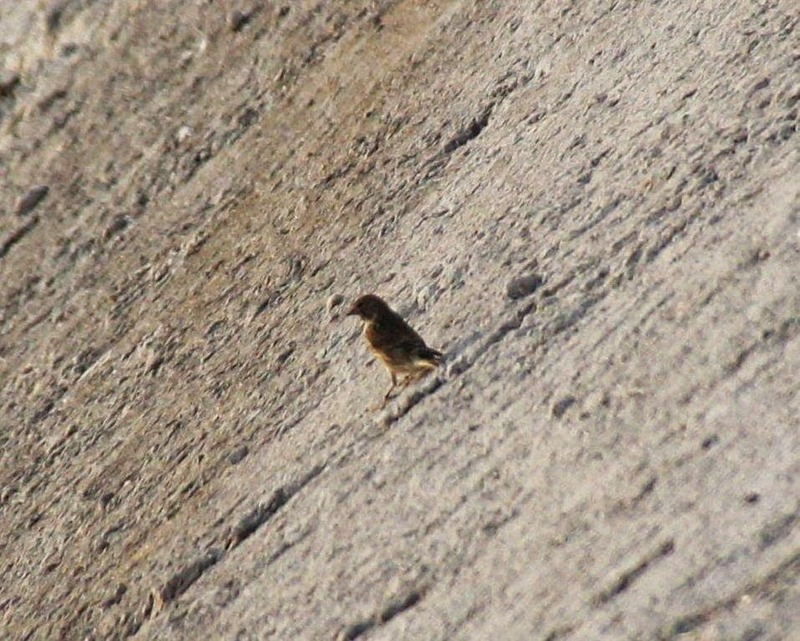 James Heron sent this pic of what is the Rock Pipit? • Friday 3rd October 2014. Peter Brazier - 20 degrees and our indian summer continues, for today anyway. Look what google autoawesome did to my snap of the Jetty! • Thursday 2nd October 2014. James Heron - Spent a couple of hours at Wilstone this afternoon. Highlight was the arrival of two ladies from the Canal and River Trust, who were looking for Crassula Helmsi, out on the mud, resulting in ALL birds flying off. 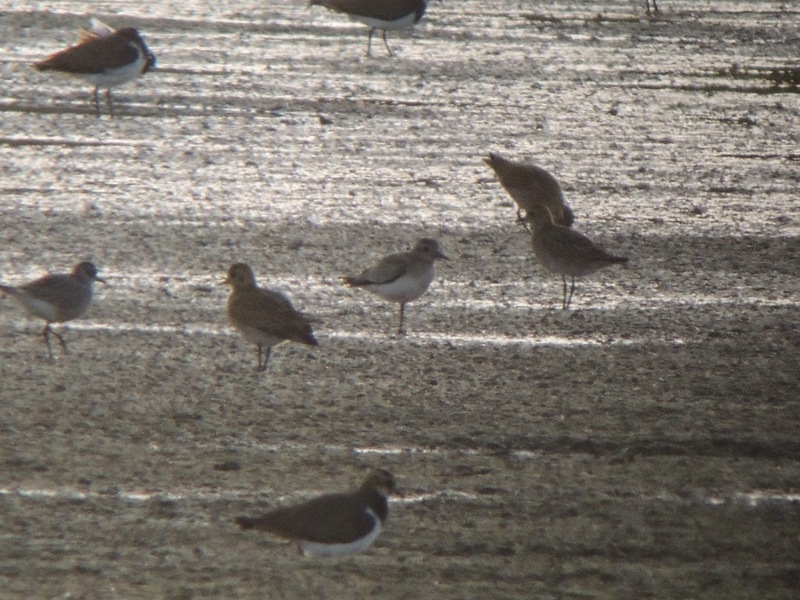 Couple of pics of reasonable quality, but only plover and godwit and of course pics of the ladies searching. • Wednesday 1st October 2014. Gary Hinton - I was about the reservoir's yesterday afternoon and saw this. It was spooked by dog walkers as I walked towards the jetty area. I was looking at a grey wag and it landed close by, but wasn't able to get any closer as another dog walker came from the other direction and spooked it again. It few off into the direction of the large tree by the steps down to the farm cafe. This was 5.30ish. 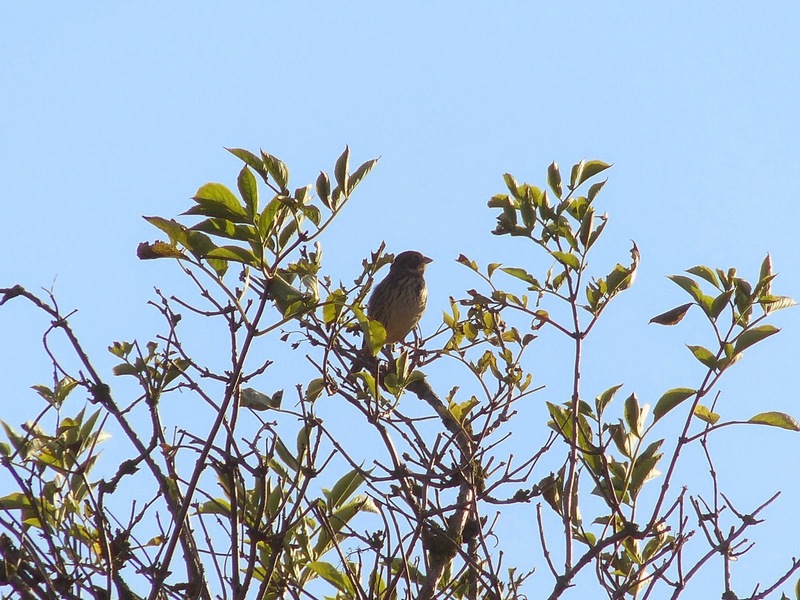 Could this be a return of the Pipit?